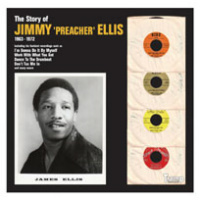 The Story Of Jimmy ‘Preacher’ Ellis is the first album from Tramp Records this year and it’s yet another superb retrospective of a black American artist from the sixties and seventies – in this case Jimmy ‘Preacher’ Ellis. Frankly, it’s almost embarrassing, the regularity with which this label is able, even now, to track down black American artists from that era who have been largely ignored despite a body of quality work. Staggeringly, this collection is the first time most of these tracks have been available since their original release decades ago. The liner notes have it that Ellis actually started out as a solo bluesman but the tracks on this (which, like previous volumes in the The Story Of… series are laid out pretty much chronologically) run from sixties rnb and soul with proto-funk elements on into full-blown funk and seventies soul. The LP kicks off with the almost skeletal shuffling beat and organ flourishes of Since I Fell For You and if this leaves you in any doubt about the proto-funkiness of the early material check the horn section of 1965 track Go Head On or I’m Gonna Do It By Myself both of which recall JB’s I Feel Good of the same year and the latter of which even has a very similar vamp at the end of the chorus. By the middle of the LP the bluesy rnb and soul of the early sixties has developed more prominent rhythms and is firmly funky – try out Put A Hoe To My Row (nothing to do with prostitutes though there’s little doubt it’s a filthy reference) where Ellis announces himself at the start in a King Curtis/ Memphis Soul Stew style as an, “Arkansas soul brother,” for proof of that. The rhythms stay heavy for the rest of the LP though smoother seventies funk and soul instrumentation become more evident in the later tracks and it’s all held together by Ellis’s raw soul vocals. Best cut? The blues-tinged heavy soul of Puttin It On Your Mind. Genius. I should point out, in the interests of journalistic accuracy, that, while the focus here is firmly on the years ’63 – ’72, Jimmy is actually still going now. Legend.